� 2007 American Honda Motor Co., Inc. I couldn't help but do a double take at the sight of Honda's double truck in the latest issue of Wired. 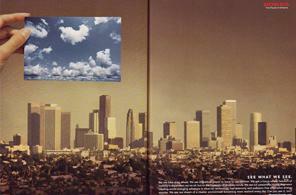 The ad, which is part of Honda's Power of Dreams campaign, portrays what looked to me like the yellow-skied Los Angeles of the 1970s, but not exactly. So I pulled out the skyline shot I had blown up last year for my wife's office and did a side-by-side comparison. 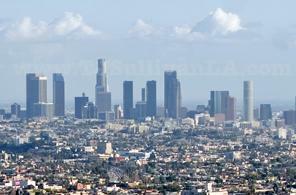 It looks to me like my Los Angeles, but with some serious alterations. Honda's mystery city has some of the same buildings, but not all of them. And, perhaps I haven't been paying close enough attention, but that yellow air looks more like a good day in Shanghai than any recent one in Los Angeles. Our air is often horrible, unhealthy and dirty. No question about it. But I've never seen it look like that. The ad talks of Honda's dream of a cleaner environment, but I'm left to wonder exactly what environment. What city is portrayed in that image? It's definitely not my LA.